Blarney ITA Taekwon-Do Club competitors had a busy weekend recently when they attended this year’s ITA Cork Open International Championships in Neptune Stadium. A record number of 849 registered to compete over two days from clubs all over Ireland, and it was a fantastic weekend with very strong performances from all Blarney ITA competitors. 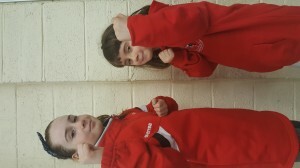 Blarney ITA first time competitors did very well and the experience will be huge asset to them going forward. Cork ITA (which Blarney ITA club are a part of) came second place with competitors bringing home 18 gold, 11 silver and 23 bronze medals. Blarney ITA is also part of the Irish Taekwon-Do Association which is Irelands number one association, with all clubs are recognised by the Irish Sports Council and IMAC. The club’s next outing will be the ITA Dublin Open International in April so they will be training extra hard over the coming weeks. Congratulations again to all, your Instructor Miss O’Mahony is extremely proud.